Thatch Barn01263 715779work01603 870304fax Self-cateringWow! A fabulous thatched barn conversion that really is a special place to holiday. The barn is beautifully styled and has its own gym room and mezzanine entertainment area. This property really does have everything for special occasion or family getaways and is set in a tranquil part of Norfolk just inland from the glorious, sandy east coast beaches. • Notes: Please note that trainers are required for the gym. The minimum age for use of the equipment is 16 with adult supervision at all times. Children under the age of 10 years are not accepted. Wow! A fabulous thatched barn conversion that really is a special place to holiday. 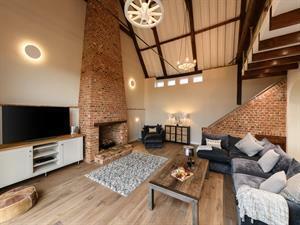 The barn is beautifully styled and has its own gym room and mezzanine entertainment area. This property really does have everything for special occasion or family getaways and is set in a tranquil part of Norfolk just inland from the glorious, sandy east coast beaches.